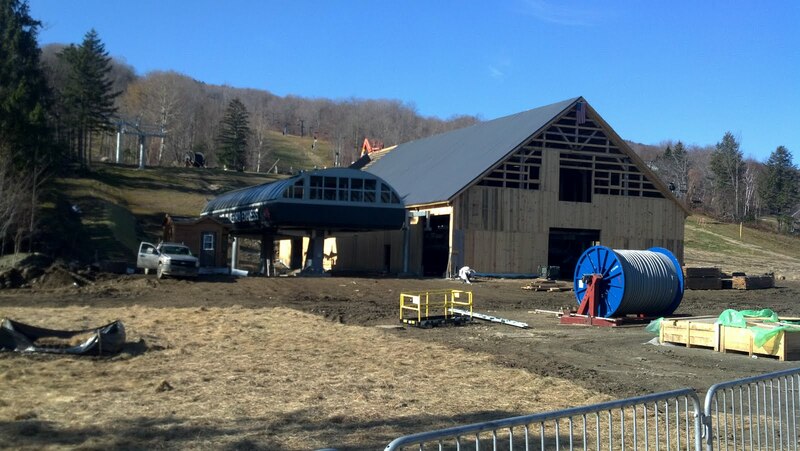 Tours de Sport's Blog: Bluebird Express Set To "Fly At Mount Snow"
Bluebird Express Set To "Fly At Mount Snow"
Had the chance to get an up close look at the progress on the Bluebird Express at Mount Snow on Wednesday, and boy is it going to be impressive. For those of you who are not familiar, his sleek super-wide beauty seats six and will have blue bubbles that will lower over the front of the chair to protect skiers and riders from the elements. What's also very cool is that the barn next to the lift terminal will serve as a big "dorm room" for the chairs, as they will be pulled of the line every night for storage. This will prevent delayed openings for de-icing when the weather is doing it's thing. A big opening celebration is planned with music, giveaways and other fun. This could happen as early as November 19th. Stay tuned for updates.